Mi3 has been highly popular smartphone in India for the last couple of weeks, but now looks like the fans will have to wait more to put their hands on this gadget. 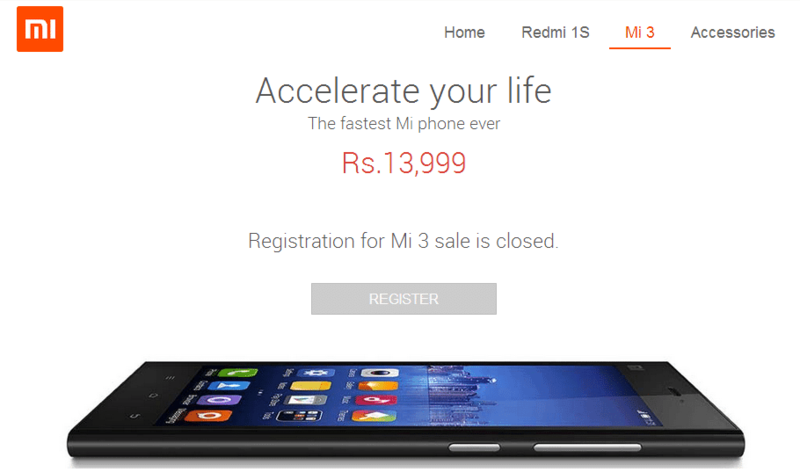 Xiaomi Mi3 has been very successful in India, with its flash sale strategy via Flipkart. In fact, the handsets got sol within a few seconds and Flipkart website crashed on the first two days of sale due to heavy traffic. Though, we have got some hints pointing towards the reason why Xiaomi has taken this decision. Xiaomi intends to focus on the newly launched Redmi 1S which is also a very good offering at a compelling price point of Rs. 5,999. Combining a Snapdragon 400 processor and quality construction. It comes with a 4.7-inch HD IPS LCD screen, Android 4.3 Jelly Bean, quad-core Snapdragon 400 processor, dual SIM card slots and a 2070 mAh battery. This smartphone has Moto G like specifications but it is priced at least 55 percent lower and also comes with a better camera. If we take a look at the price segment, the Redmi 1S competes with Asus Zenfone 4, Moto E and Micromax Unite 2. With Mi 4 already launched in China, and expected to hit the Indian shores in Q1 2015, we might very well say goodbye to the Mi 3. Hugo Barra clarified that Xiaomi will be bringing the 4G LTE in Mi 4 which is still under development. It is rumored to be priced around Rs.19,999, but the launch is still 3 to 4 months away.